And where are they moving? Get this: PARK SLOPE! 4th Street and 7th Avenue. My confused look must have translated into: "Uhhh. Isn't the rent a lot higher there?" 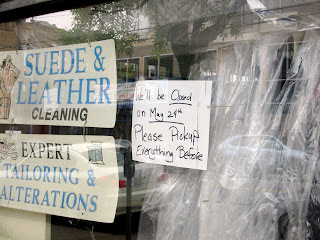 because the son explained that they could charge a lot more there for cleaning and tailoring than here. I'll say. This place put in perfect cuffs on several pairs of pants for nothing, and it's been taking care of my husband's shirts for years. It may seem like a splurge, but wrinkled shirts are depressing in the AM. I have to say, I was (and am) so sad about this. I have enjoyed trekking over to Ho Ho to pick up shirts and have micro-chats with the proprietress. She's very friendly and capable and Park Slope doesn't deserve her! 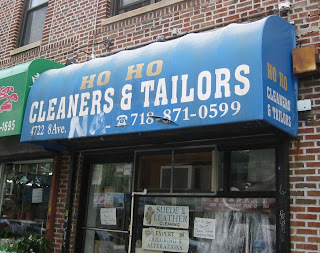 Well, I've dropped off my last batch of button-downs with Ho Ho. And now I have to find a place that will clean and press shirts for me for a reasonable sum. This is clearly a sign that residents are going to have to chase rents in the near future. What's next? No more $3.50 sandwiches from Ba Xuyen? Thank you, Ho Ho, you have indeed been Very Good to us! Best of luck in Park Slope, and the store fronts on 8th and 46th/47th will probably still be open if and when you want to return.